Mobile Pay. Need you say more? Who needs credit and debit cards when you have a cell phone that will store all of these for you. The accessibility and convenience of this option is being adapted quickly by many major companies: Apple Pay, Samsung Pay, Google Wallet… and that is just the tip of the iceberg my friends. But to make the deal sweeter, businesses are running with it, consumers LOVE it and they want more. The idea of not having to carry around that bulky wallet with tons of cards is appealing especially to the gen-x and millennial generations, who want it right now. By simply pulling the phone out that they are on at least 10 hours a day, they can now have everything in one tiny device. To me, I still like to carry my cards around with me as the idea of losing my phone and having all of that information on there scares me to death but tons of people love it and despite my worries it is deemed to be a very secure method of payment. Mobile pay continues to be in high demand and is expected to rise as a payment method in 2016 to $148 million in e-commerce sales overall with around $60 million of that being mobile pay. That is a HUGE number. Businesses love it and are rewarding their customers for using it. Many businesses are offering discounts, mobile pay only promotions and sweepstakes for customers who use their smartphone apps for purchases. Some big companies who are killing this include none other than Starbucks of course, PayPal and other large retailers. Starbucks has dominated this market with 1 of their 5 payments received being made through their mobile pay. With over 4,000 stores and $10.6 billion dollars in coffee sales a year.. That is a lot of mobile payments. They also offer the convenience of ordering from your app and paying ahead through mobile pay to help avoid the lines in their always busy stores. It really is genius if you look at it in the broader spectrum. They have just thrown more shots at Dunkin’ Donuts and are improving their customer focus and convenience every single day. Touche Starbucks… Touche. 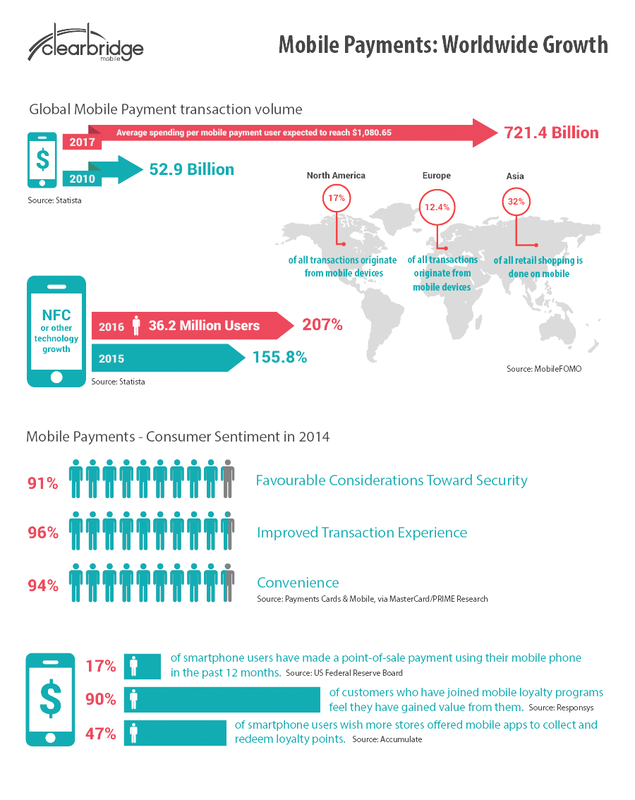 So yes, mobile pay has grown significantly. It is becoming the new thing, whether it is adding a chip to your credit card to increase purchasing speed at the register or simply uploading everything onto your smartphone. It is growing and growing fast so I ask you, are you becoming a part of the revolution or are you going to stick by side and continue to carry those cute wallets and purses around while everyone behind you in line rolls their eyes?